home - blog - Bed Linen, Linen Clothes, Linen Pyjamas, Linen Sleepwear - What’s Your Favourite Sleepwear? This week we want to talk sleepwear. Since Marilyn Monroe famously stated she wore nothing in bed except Chanel No.5, the matter of what we wear in bed has been a popular talking point. If you prefer to wear something more substantial than fragrance to sleep in, what do you choose? Cosy, comfortable pyjamas? Or a cute nightdress? And then of course there’s robes. Some of us love to waft around the house draped in an elegant robe, whilst others make like The Dude and go for a chunky number (though I’m sure in a more stylish way). What’s your favourite type of robe? 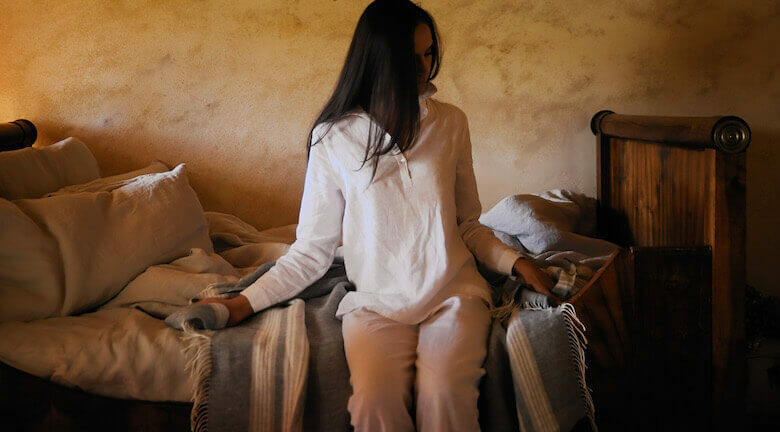 With sleepwear on our minds, here are some of our faves from our pure linen sleepwear range. All of our garments are made by skilled artisans using a combination of heritage looms and new technology. Perfect for this in-between season (yesterday in London we had sunshine, rain and hail in the space of a few hours! ), linen keeps you warm but prevents you overheating when the mercury rises, and its moisture-wicking properties keep you dry and feeling fresh all night. Our linen is top grade, meaning it feels deliciously soft, will wash brilliantly and lasts for ages. So you can sleep peacefully knowing that, whether you choose pyjamas or a nightie, we’ve got you covered. If you are a pj-lover these gorgeous linen pyjamas are just the thing. Cut loose but not too loose, they are comfortable yet flattering, drapey yet defined. The trousers have a drawstring waist so you can get them to fit just right for you, and the pull-on top is finished with cute details like mother-of-pearl buttons and gently gathered sleeves. They also come in a range of colours, giving you lots of choice. For a blissful night’s sleep and some seriously stylish lounging, you might want to snap these up immediately. Perfect for Spring/Summer our super-soft linen nightdress is a cute option for nighttime. And for lazy weekend brunches. And for post-work, post-bath TV binges. And for curling up under a blanket with a good book. We love the simple neckline and unfussy yet considered shape. If you find yourself also longing to wear it during the day you can pair it with some jeans or leggings and style it as a shirt dress. For the comfort-seekers amongst us (and there are many) the hunt for the perfect robe can be frustrating. From bulky terry cotton to elaborate kimonos, it can be hard to find something that you will want to be seen wearing while you nip outside to put the garbage out, or for making breakfast for a crowd of houseguests. Our linen robes offer tactile comfort and a decent amount of cover-up, without being unwieldy and chunky. Wear over your comfiest jogging bottoms and a t-shirt for a more stylish lounging look, or over pyjamas or a nightshirt for extra warmth and modesty. The linen feels lovely against your skin, and gives a beautifully fluid shape, and the 3/4-length sleeves mean you can whisk up scrambled eggs or cradle your coffee without fear of getting anything on your gown. Choose from four colourways and two lengths, depending on your preference. Whatever you choose, you’ll be very happy you did. A linen robe also makes a brilliant gift for Mother’s Day or for someone special who deserves a bit of pampering and care. And whilst we are on the subject of beds and sleep, don’t forget to browse our gorgeous range of stonewashed linen bedlinen. We believe you will sleep better – and feel better – enveloped in some of our luxurious linen. What do you love to wear in bed?